it doesn't matter how You found this place amongst the depths and undepths of a world wired west. You'll neither be confronted with long-winded background stories, nor a facebook-like-button, a forum or a guestbook. 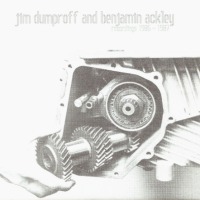 This website is dedicated to be a place in memorial of our friend Jim Dumproff, a passionate creator of minimalistic synth-music who passed away age 37 one day in late summer 1992. Furthermore we want his music to be available for a wider audience, as we believe it would have been in his sense. He never released any commercial audio, therefore none of his material is protected by copyright. We decided to implement this page in such reduced style, cause we believe he would have endorsed it. With a minimum of verbal onanism, as he might have said. We even asked ourselves the question how Jim would have approached on the task of creating a website by himself. Well, he probably would have used a maximum of three colors and a sourcecode edited on a plain text-editor, changing the file extension afterwards to .htm. Please see the previous note as a humorous example of typical J.D. peculiarities. He was extreme in many different ways, somehow quirky, paired with a strange sense of humor. On the other side he could be deeply serious, spreading an atmosphere of gloom within his orbit. If You came here because You knew Jim back in the days, feel free to contact us. We would be pleased to get to know some of the people he used to visit during his extensive journeys to Europe and South America during the second half of the 80s. As mentioned above, the main purpose of this website is to make his music available for the interested. If anyone out there owns additional recordings of Jim's music and may be willing to put those at our disposal for use on this website, please contact us. 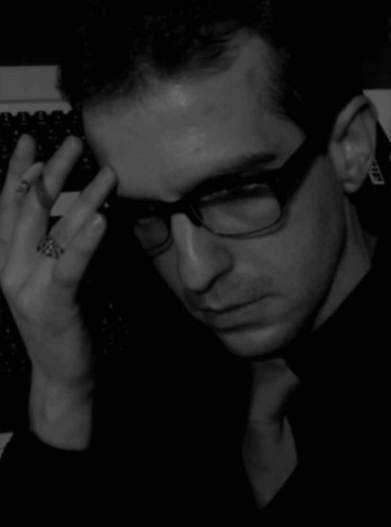 To answer the question what kind of music Jim created during his creative phases, nowadays people might use terms like minimal, noise, industrial … whatever. Back in the days we simply called it aggrowave, as we still do today. Just because of aggressive tunes e.g. Agony and Meltdown from his early works. With exceptions, minimal wave/synth might fit the sound of his later recordings from the period between 1986-87. Those tracks were recorded with assistance of our mutual friend Ben Ackley. Following section represents the period from 1986 to 1987. All tracks provided by Ben Ackley. 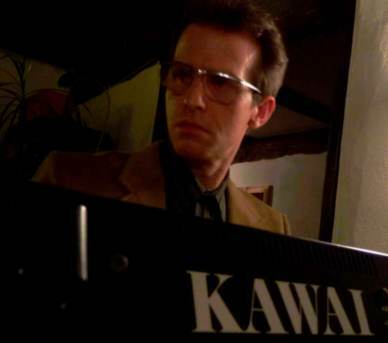 According to Ben, equipment they used on those recordings were Korg Polysix, Korg Poly 800, Akai AX-73, Kawai SX-240, Oberheim Matrix 6, Roland SH-101, SCI Drumtraks, EMU Drumulator, Commodore 64, Atari ST, Casio VL-Tone, Casio SK-1 and a bunch of effect units. Simply use rightclick and 'save as' to download the audiofiles in mp3 format. … including additional data (cover, lyrics, etc.). 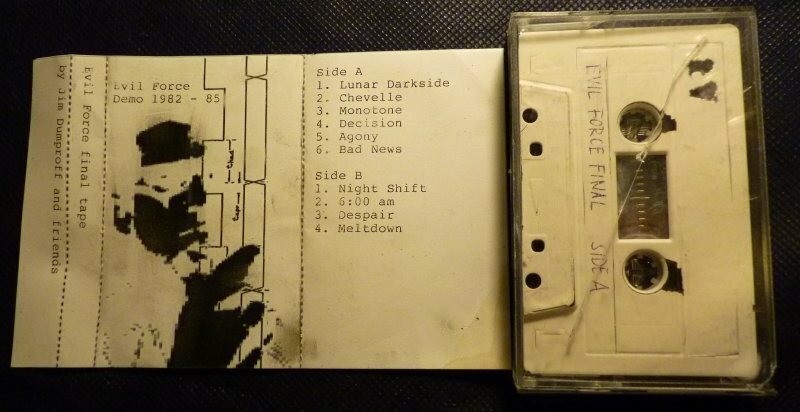 The following ten tracks originate from Jim's so called Evil Force final demo tape, pictured on the right. Those tracks date back to the period of his early works between 1982 - 85. According to Ben, Jim seemed to have used synthesizers of the Korg MS series and the Teisco 100F to create most of the sounds. Furthermore he mentioned that Jim used some unconventional tone generators, as for example a telex or matrix-printer on track A06-bad news. Following tracks were also provided by Ben, who used a few post-production tools to filter the whitenoise from the audio, taken from the original music-cassette. It's a bit problematic to find any final words. Further I don't want things to appear too pathetic, Jim would have hated that. 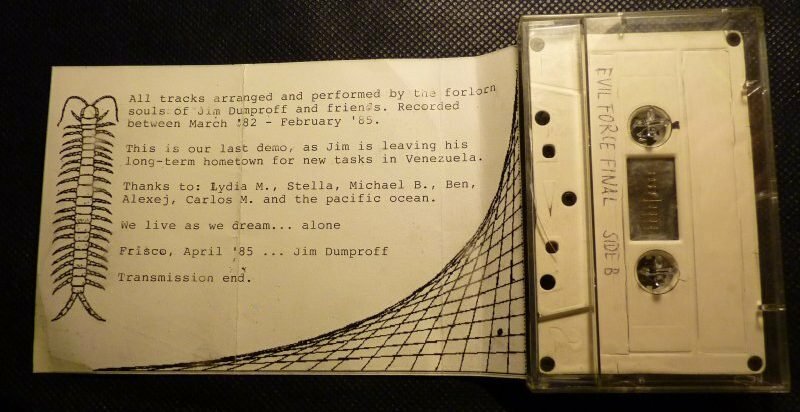 On this point I simply claim the privilege of the author and close with my personal view on Jim Dumproff: There's this famous quote 'it's better to burn out than to fade away', which cannot be applied to Jim's character one by one. In retrospect I believe that, on some point of his life, he had decided for both simultaniously → burning out and fading away. Those who knew Jim may agree or not ... others may just shake their heads in disbelief. To be honest: I don't care. Special thanks to: Ben Ackley for providing audio, pictures and background information. Right now, as I write down these lines, I remember us hanging out at Nick's Lighthouse on Fisherman's Wharf. It's been six years since then and I hope to be able to visit You and Lydia in California next summer.